Bust out your planners, calendars, and PDAs (if you are throwback like that), it’s time to mark your calendars for the HMNS events of this week! Witness the exquisite objects related to the legendary Samurai warriors of Japan in the special exhibition Samurai: The Way of the Warrior. Museum master docents will lead you through the collection that includes full suits of armor, helmets, swords, sword-hilts, and saddles, as well as exquisite objects intended for more personal use such as lacquered writing boxes, incense trays and foldable chairs. Featuring 100 awe-inspiring images, from fascinating animal behavior to breathtaking wild landscapes,Wildlife Photographer of the Year harnesses the power of photography to promote the discovery, understanding and responsible enjoyment of the natural world. Tour this visually stunning exhibition with our resident photographers David Temple and Janell Nelson. 9 a.m. – 1:00 p.m. 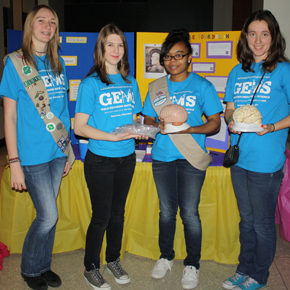 The Girl Scouts of San Jacinto Council and the Houston Museum of Natural Science invite you to attend the Girls Exploring Math and Science (GEMS) event. The Museum will be filled with hands-on science and math for everyone to experience. Local professionals will be at the Museum to answer questions about their careers in the fields of science, technology, engineering and math. Thanks to the Society of Petroleum Engineers / Gulf Coast Section for its support of GEMS 2015! Did you get a new telescope? The box made it sound easy to use. Come let an expert astronomer help you set it up and polar align your scope so that it will work. It is not as easy as the box would lead you to believe! After you get some help, then it will be easy and enjoyable. Next Post Educator How-To: Make a Balancing Dipsy!